Emilio Salgari (1862-1911) is one of the great writers of swashbuckling adventure fiction. He also wrote westerns and science fiction. In his native Italy and throughout Europe and Latin America he was, and indeed still is, immensely popular. He is much less known in the anglophone world and only a small proportion of his vast output has been translated into English. He is best known for his tales of the Black Corsair and the Sandokan cycle. The Tigers of Mompracem is the first of the Sandokan novels (although some would count The Mystery of the Black Jungle as the first). The Tigers of Mompracem was published in serial form in 1883-84 and in book form in 1900. The Tigers of Mompracem is a pirate tale but this book differs quite radically from most other pirate stories. First of all the action takes place not on the Spanish Main but in the South China Sea. Secondly, while the Sandokan stories tell of an epic struggle between the British and a notorious pirate the British are very much the bad guys. Thirdly, the events recounted in the novel begin in 1849, when the age of sail was giving way to the age of steam. Sandokan’s pirate fleet is hunted by British steam frigates. 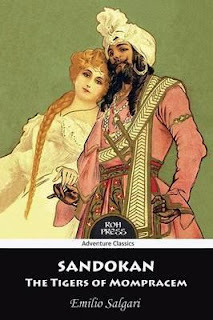 Sandokan is a prince of Borneo. He blames the British for the loss of his throne and for the deaths of most of his family. As a result he was forced into a life of piracy. He is a very successful pirate and immensely rich. He’s not quite a Robin Hood figure but he can be extremely generous. He inspires fanatical devotion in his followers. He has a sense of honour. It is not quite a European sense of honour but he is a man whose word is his bond. Sandokan’s greatest enemy is James Brooke, the legendary White Rajah of Sarawak. Brooke was an English adventurer who carved out a kingdom for himself in northern Borneo which he ruled from 1841 to 1868. Although 19th century adventure writers often had complex and nuanced view on colonialism Salgari was unusual in being absolutely and implacably opposed to colonialism. Sandokan is a sworn enemy of the British but he doesn’t like the Dutch or other Europeans any better, although his closest friend and colleague in piracy is Portuguese adventurer Yanez De Gomera. Mompracem is Sadokan’s lair, a small island northwest of Borneo. The Tigers of Mompracem begins with a sea battle that does not go well for Sandokan. His small fleet is sunk by a British steam cruiser. Sandokan is badly wounded and almost drowned and loses consciousness. When he awakes he is in a warm dry bed. He has been found on the beach and is now in the care of British nobleman Lord James Guillonk on the island of Labuan. Guillonk has no idea of the identity of the handsome young Malay although his manners and obvious education make it easy to believe that he is indeed a native prince. When he discovers that this is the bloodthirsty pirate Sandokan, the Tiger of Malaysia, there is clearly going to be trouble. To make that trouble even more certain Sandokan has fallen in love with Guillonk’s beautiful daughter Marianna and Marianna has fallen in love with him. Somehow Sandokan will have to escape from the island of Labuan and make his way back to Mompracem, he will have to rebuild his pirate fleet and continue his war against the hated British while also finding a way to carry Marianna off from Labuan and marry her. He will find himself hunted on land and at sea and at times all will appear to be lost but Sandokan is not a man who gives up easily. Sandokan has many virtues. He’s certainly brave. He’s an inspiring leader. I have to say though that he strikes me as a man of exceptionally poor judgment. He is reckless to the point of foolishness. Of course it has to be admitted that in this book Sandokan is a man consumed by love and so perhaps his judgment is usually quite sound. It is also possible that Salgari was trying to create a non-European hero who behaves in a non-European way, being rather fatalistic and inclined to place his faith in his own luck. In fact Sandokan’s recklessness and fatalism do make him an interesting hero. He veers between insane over-confidence and the depths of despair and these wild swings can occur several times in the course of a single day. He comes to believe that his luck has run out and that this is something he just has to accept but at the same time it never occurs to him to surrender or to stop fighting and a man who won’t surrender is very difficult to destroy. The British bad guys are stock melodrama villains. Marianna is pretty much a stock melodrama heroine as well, although with a certain feisty streak. The Tigers of Mompracem is an unusual pirate adventure with an unusual hero. There’s action in abundance, there are exotic settings, there’s jungle adventure as well as adventure on the high seas, there’s an epic love story and I personally find the outrageously melodramatic touches to be a bonus. There’s plenty of fun to be had here. Recommended. Salgari’s Black Corsair tales (beginning with The Black Corsair) are also worth checking out.